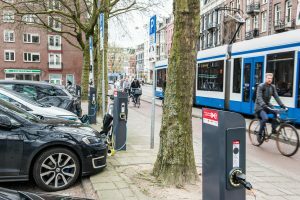 Amsterdam is preparing for an expected increase of electric cars and more and more locally generated renewable energy in the city. In March 2017 the city started a ‘flexible charging’ project with its partners Nuon, Liander and ElaadNL. By steering the charge flow of electric cars, peak loads can be avoided and the demand can be matched to the availability of local produced sustainable energy. The design of the current electricity grid has not taken into account the arrival of electric cars. At this stage there is no direct problem, but an uncontrolled increase of chargers on the low voltage grid might lead to peak demands that exceed the grid capacity. Therefore, it is necessary to start testing how smart charging helps to overcome this. The pilot begins with two hundred public charge stations with two sockets each in the center, the West, New West and South of Amsterdam. The charging speed is adjusted on the basis of the use of the electricity grid. At the start of the test, the charging speed for electric cars is increased during 00.00 – 07.00 hours, 08.00 – 17.00 hours, and 20.00 – 24.00 hours (outside peak hours). This means they will be charged faster than normal at this time of the day. Only during peak hours (between 16.30 and 19.30), when other devices (such as devices in households) demand more power, the cars are charged slower and with less power. With this method more e-drivers can use the same charge point and less public charge points are needed. The goal of the project is to gain insight in the potential of smart charging and, even more important, what is needed to utilize the full potential of smart charging possible and what the restrictions are to implement smart charging on large scale. For the SEEV4city project, Amsterdam wants to look at the opportunity to outbalance supply and demand of renewable energy production on a local level on this FLexPower charging stations.